Reacts with most cyclin Bs. Full length protein corresponding to Xenopus laevis Cyclin B2/CCNB2. Our Abpromise guarantee covers the use of ab18250 in the following tested applications. WB Use a concentration of 2 µg/ml. Predicted molecular weight: 45 kDa. The antibody may give a high background if the concentration of the antibody is above 2µg/ml. The gel was denaturing. Blocked with a 5% milk solution for 2 hours at 24°C. The primary antibody was diluted in 5%Milk/Tris-Buffered Saline/0.05%Tween20 and incubated for 16 hours at 4°C. IHC image of ab18250 staining in human cervical carcinoma formalin fixed paraffin embedded tissue section, performed on a Leica BondTM system using the standard protocol F. The section was pre-treated using heat mediated antigen retrieval with sodium citrate buffer (pH6, epitope retrieval solution 1) for 20 mins. The section was then incubated with ab18250, 1µg/ml, for 15 mins at room temperature and detected using an HRP conjugated compact polymer system. DAB was used as the chromogen. The section was then counterstained with haematoxylin and mounted with DPX. 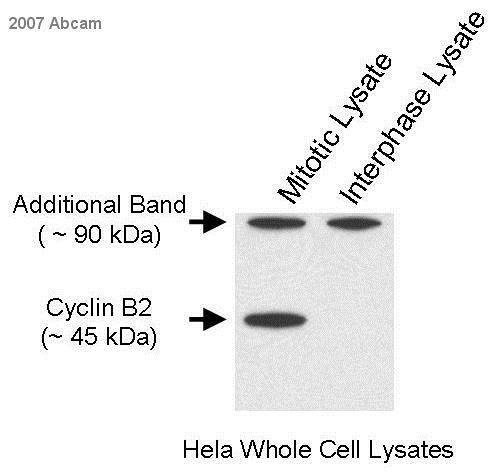 Overlay histogram showing HeLA cells stained with ab18250 (red line). The cells were fixed with 100% methanol (5 min) and then permeabilized with 0.1% PBS-Tween for 20 min. The cells were then incubated in 1x PBS / 10% normal goat serum / 0.3M glycine to block non-specific protein-protein interactions followed by the antibody (ab18250, 1µg/1x106 cells) for 30 min at 22°C. The secondary antibody used was DyLight® 488 goat anti-mouse IgG (H+L) (ab96879) at 1/500 dilution for 30 min at 22°C. Isotype control antibody (black line) was Mouse IgG1 [ICIGG1] (ab91353, 2µg/1x106 cells) used under the same conditions. Acquisition of >5,000 events was performed. Publishing research using ab18250? Please let us know so that we can cite the reference in this datasheet. Thanks for review this data. We have rerun the test again according to your below recommendations, we were still unable to achieve a good outcome. I am attaching the data with email for your review again. we hope to hear of your advise, and whether a different lot might be accessible. Thank you for your reply. I am sorry that the antibodies are still not producing good results in WB. We do not currently have new lots available for either product, so I have issued you a refund (Credit Note: ***). To redeem this refund, please have your purchasing agent contact our accounting department at us.credits@abcam.com. Please let me know if you have any further questions. Attached please find the antibody ab18250 & ab75743wb questionnaire answer sheets. We did not observe an optimal results over these two antibodies. we would look forward to any suggestion or advice you may have. Thank you for contacting us. I am sorry that these antibodies are giving weak signal in your samples. For Cyclin B2, I would expect ab18250 to give good staining using the protocol you sent, however this protein is not very highly expressed in normal or cancerous liver. You may find better results testing a positive control such as bone marrow or HeLa cells. 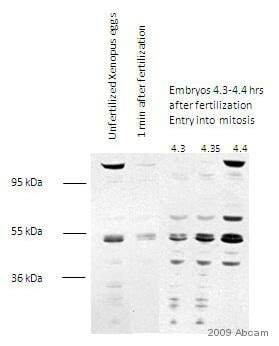 The antibody ab75742 is phospho-specific, so I would not recommend using milk as a blocking agent. Milk contains endogenous phosphatases which can cleave the phosphorylations of interest and results in significantly reduced signal. Switching to BSA may help to improve the strength of your band. Have you done any treatment as a positive control to ensure that this particular phosphorylation is expressed? I' m sending the informations that can be useful to receive suggestions about 18250 Ab. Blocking solution prepared: 3% BSA in PBS 1X Antibody dilution utilized: 1/1000 in blocking solution Waiting your reply, all my best regards.